To mark the launch of its Galaxy S10 family of devices and 10 years of Galaxy products, Samsung has opened a giant two-storey pop-up store in west London's Westfield shopping centre. The store will remain open until 28 April 2019. The first things you notice as you arrive at Samsung's Galaxy Studio are the huge number of staff on hand to look after visitors and the effort the company has put in to make this feel like an exclusive, premium, VIP experience. 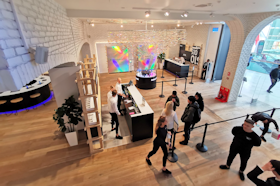 As customers check-in, they're given a Galaxy S10+ phone to use for the duration of their visit, and they're then chaperoned through different zones offering experiences designed to highlight several of the phones' features. Visitors wander through these individual areas, and if they collect all the necessary digital stamps, they get a small gift as they leave. Most experiences at the venue focus on the camera, but they also draw attention to other capabilities such as NFC tags and heart-rate monitoring. 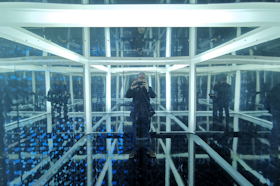 In three of the zones — Field of Heart, Sonic Radiance and Ocular Odyssey — visitors enter a small room with amazing optical effects, mirrors and more, where they can try specific camera features including low-light capabilities and selfies. 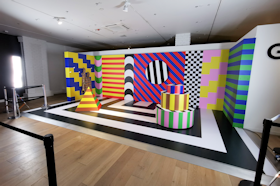 There's also an art installation with bright colours and kaleidoscopic effects, where people can test some of the live-focus and wide-angle lens features on the camera. The scale and ambition of the venue is breathtaking and underlines Samsung's determination to make the new S10 family a success. It also reflects the enormous competitive threat that the company faces from Huawei in Europe, and especially in the UK, where its Chinese rival is investing eyewatering sums promoting its brand and marketing its new P30 series devices. The two phone-makers are battling it out for digital and physical advertising dominance, making it more important than ever to engage effectively with customers. It's hard to judge whether pop-up stores like this can really have a widespread impact on the success of Samsung's product, particularly in the context of falling demand for smartphones in the UK, but the company must clearly believe the Galaxy Studio will deliver meaningful returns. 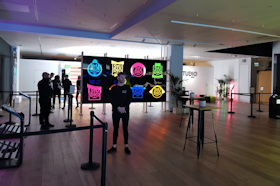 There's no question that visitors leave the pop-up shop with a much better understanding of what the Galaxy S10 smartphone family can offer, although some of the demonstrations were a little confusing and could be improved. However, without a clear understanding of the goals of the project and how many people end up visiting this temple to the S10 family, I left the experience a little dazed and wondering if such huge spending would really deliver a significant sales boost. That said, I certainly admire Samsung's ambition with what's probably the biggest pop-up store experience ever curated for a smartphone launch. It highlights what big business the smartphone market represents, and the lengths that manufacturers now need to go to in order to capture consumers' attention and educate them about the nuances of their devices at a time when most high-end smartphones largely look the same.